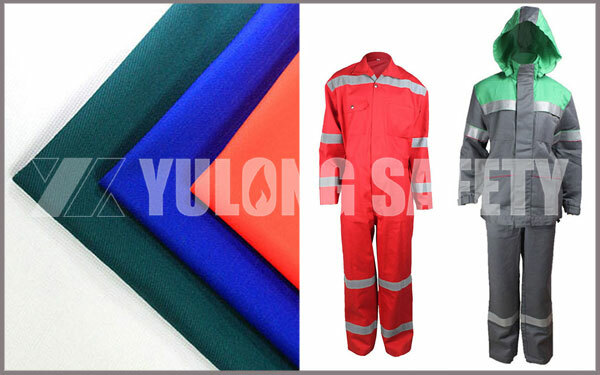 On 11th,Dec, a european client visited Yulong company, first of all ,the clients brought his flame retardant fabric information, there are cotton 7oz flame retardant fabric,and 9oz, 10oz,12 oz, cotton nylon flame retardant 7oz and 9oz, and antistatic flame retardant fabric related products, according to the variety of client’s ,we take our related flame retardant fabric bulk quality fabric, and corresponding certificates, test reports and datas, after checked our products and the quality, fully affirmed our quality, chose different quality samples, and took them to their guests and leaders to see our flame retardant fabrics. In addition, the client also brought two types of flame retardant clothing, hope we can cooperate to produce, not only the fabric but also the accessories are flame retardant ,like FR reflective tape , FR thread ,FR zipper, FR button, FR velcro, FR embroidery label, etc. And asked the flame retardant clothing should pass the EN11611,EN11612 ,EN1149-5 ,EN13034 and arc proof category level 2 tests. According to all standards, and combined with client's real sample, our employees of fabric department confirmed all specification and functions which needed, confirmed that what clients need is flame retardant antistatic and anti-acid and alkali 100% cotton fabric, also calculated the fabric price, technitist of garment department confirmed kinds of accessories cost, processing cost and lining fabric cost according to clients cloth sample, so we have the final cloth price very soon. The client satisfied with our ability to quickly confirm the relevant products and quotations, and have repeatedly affirmed our service and hope that the future cooperation will be more enjoyable.